In the more than seventy years of its existence, UN Peacekeeping has evolved significantly as a tool of international crisis response. UN Peacekeeping has proven to be an essential instrument for global peace and security over the years. Our fourteen peacekeeping operations around the world today illustrate the wide range of mechanisms, strategies and resources that the United Nations marshals in support of peace and security. In recent years, however, our missions have been deployed to increasingly difficult and complex environments, even as demand for peacekeeping has increased. Our core business processes have not kept up with these demands. Mandate implementation is hindered by slow, unresponsive service delivery, micro-management by governing bodies, a trust deficit with Member States and with staff, inadequate resourcing of and ineffective implementation of mandates and a lack of transparency and accountability. To respond to these challenges, the Secretary-General launched Action for Peacekeeping (A4P) to renew mutual political commitment to peacekeeping operations. The Secretary-General has called on Member States to join him in developing a set of mutually-agreed principles and commitments to create peacekeeping operations fit for the future, with the goal of reaching a formal agreement by the end of 2018. Secretary-General António Guterres has proposed reforms in the United Nations peace and security architecture, in the UN’s management system and structures, as well as in the UN development system. His vision of the reform of peace operations places politics at the centre of our work. It has the overall objective of reducing fragmentation for better delivery, to make the peace and security pillar more coherent, nimble and effective by prioritizing prevention, sustaining peace and delivery on Agenda 2030. A series of strategic reviews of major peacekeeping operations have also been initiated which will focus on assessing the presence of conditions for successful mandate implementation with a view to recommending adjustments to the Security Council. Parameters of assessment for the reviews will include the relevance and pertinence of mandates, the political environment and will of key parties, our operations’ comparative advantage vis-à-vis regional, UN and other partners, and the configuration of support for the mission. These reviews will identify ideas for new, enhanced peacekeeping approaches and will strengthen our cooperation for prevention through early action, as opposed to merely reacting to outbreaks of violence. Former Secretary-General Ban Ki-moon established a High-level Independent Panel on UN Peace Operations on 31 October 2014, to make a comprehensive assessment of the state of UN peace operations today, and the emerging needs of the future. Announcing the decision, the Secretary-General said that “the world is changing and UN peace operations must change with it if they are to remain an indispensable and effective tool in promoting international peace and security.” With the 15-year anniversary of the Brahimi report approaching, the Secretary-General felt that it was necessary to again take stock of evolving expectations of UN peacekeeping and how the Organization can work toward a shared view of the way forward. The 16-member Panel was chaired by Mr. Jose Ramos-Horta (Timor-Leste) with Ms. Ameerah Haq (Bangladesh) as Vice-Chair. It drew together a wide range of experience and expertise. The Panel considered a broad range of issues facing peace operations, including the changing nature of conflict, evolving mandates, good offices and peacebuilding challenges, managerial and administrative arrangements, planning, partnerships, human rights and protection of civilians. The review encompasses both UN peacekeeping operations as well as special political missions , which are referred to collectively as “UN peace operations. The Secretary-General received the Panel's report on 16 June 2015. The Secretary will study the recommendations of the report carefully and transmit it to the General Assembly and the Security Council. Reinvigorate the ongoing dialogue with stakeholders on possible solutions to better calibrate UN Peacekeeping to meet current and future requirements. 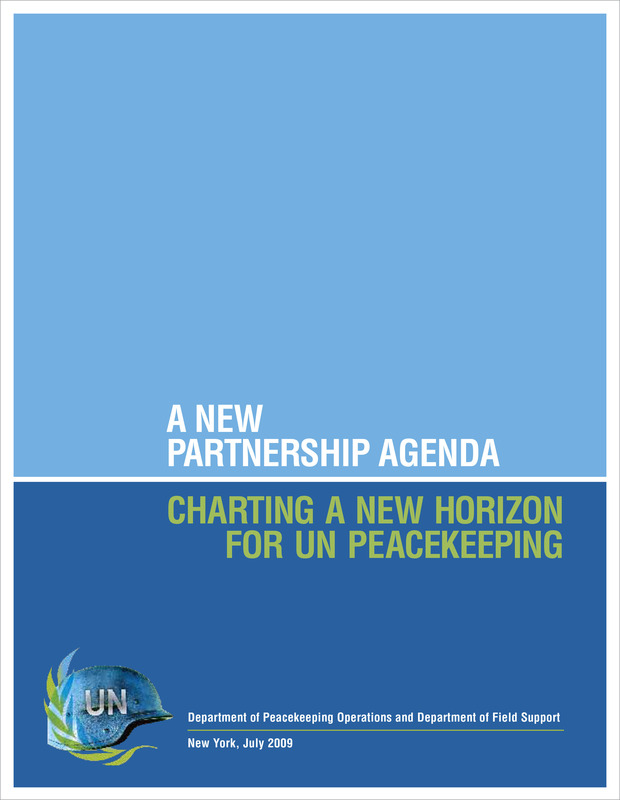 A New Partnership Agenda: Charting a New Horizon for UN Peacekeeping is an internal document prepared as part of the “New Horizon” process of developing a forward agenda for UN Peacekeeping. It reflects both the perspectives of the Department of Peacekeeping Operations (DPKO) and the Department of Field Support (DFS). The paper, which was released to Member States and peacekeeping partners in July 2009, supported a reinvigorated dialogue with the aim of forging a peacekeeping policy agenda that reflects the perspectives of all stakeholders in the global peacekeeping partnership. Building on previous peacekeeping reform efforts, the paper highlighted achievements in improving the peacekeeping tool and identified outstanding, as well as new, dilemmas that require the attention of the peacekeeping partnership. Key elements of the paper were taken up by the Secretary-General in his Report to the Special Committee on Peacekeeping Operations [A/64/573]. These have informed formal and informal deliberations among members of the peacekeeping partnership to help crystallize a common vision of the requirements to bolster peacekeeping to more effectively fulfil its role in support of international peace and security. Since the issuance of the New Horizon document, DPKO and DFS have issued periodic progress reports summarizing the principal outcomes of the peacekeeping dialogue and implementation efforts in the context of the New Horizon process. The most recent progress report, The New Horizon Initiative: Progress Report No. 2 was issued in December 2011. It outlines progress on implementation of reform priorities since the issuance of The New Horizon Initiative: Progress Report No. 1 in October 2010 and highlights ongoing efforts to improve the effectiveness of UN Peacekeeping. In March 2000, the Secretary-General appointed the Panel on United Nations Peace Operations to assess the shortcomings of the then existing system and to make specific and realistic recommendations for change. The panel was composed of individuals experienced in conflict prevention, peacekeeping and peacebuilding. The Panel noted that in order to be effective, UN peacekeeping operations must be properly resourced and equipped, and operate under clear, credible and achievable mandates. High-level Panel on Threats, Challenges and Change [A/59/565] , setting out a broad framework for collective security for the new century.